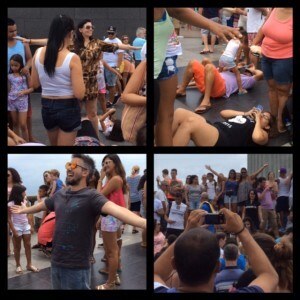 I made my way to Rio de Janeiro during the week that included Christmas, Boxing Day and New Years Day. This was partially due to my need for sun but also to quiet those who saw that Brazil was not represented in my current country count and repeatedly reminded me of it. Adding Brazil to your travel map does indeed look quite good. Of course, Brazil in and of itself is quite a spectacular country, and well worth the visit regardless of motivation! What would a trip to Rio be without seeing Ipanema beach, Copacabana beach, or Sugar Loaf mountain? For that matter what would it be without seeing Rio’s most iconic symbol, the statue known as Cristo Redentor [Christ the Redeemer]? 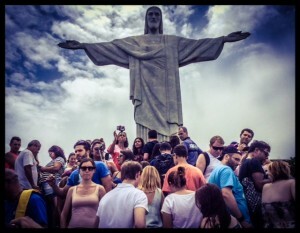 Completed in 1931, Cristo Redentor is an Art Deco statue of Jesus created by French sculptor Paul Landowski and built by the Brazilian engineer Heitor da Silva Costa. The face was created by the Romanian artist Gheorghe Leonida. The statue is 98 feet [30 meters] tall with arms that are 92 feet [28 meters] wide. It is located on the top of Corcovado mountain in the Tijuca Forest National Park overlooking Rio. Word to the wise – book your tickets in advance. If you do not and it is a busy week, you will be subject to a bait and switch, and end up standing in no less than four queues for much longer than you want to. On the day of my arrival at approximately 10:30am, the tickets for the small train up Corcovado were already sold out through 4:00pm, so my travel buddy and I decided instead to take one of the small white vans that would shuttle us swiftly [or so we thought] to the top of the mountain. Without having the process explained to us or any explanatory signage whatsoever, we jumped in one of the vans, waited about ten minutes, and then were shuttled to a location close by to buy tickets for the van we were already in [queue #1]. One this was done, we got back in the van, and were shuttled up the mountain to queue #2. This queue, more than an hour long, was to buy tickets to get into the “park” itself. Once we had purchased tickets to the “park” we were then herded to queue #3, another hour+ queue to get back into the white shuttle bus and get transported to the top. At the front of that queue we were led down a path to a shorter queue #4 to wait to be loaded into an actual van. By this point, out patience was wearing thin. 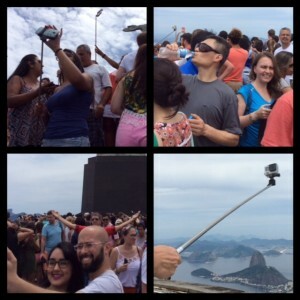 Things did not get much better once we reached the Cristo, as instead of a serene location with spectacular views of Rio, we arrived at the worst kind of selfie stick hell, complete with people laying on the ground to get the best angle, and their friends standing, arms stretched out to mimic the statue, just to get the perfect Instagram pose. What happen to us? We can’t enjoy a site without taking a thousand photos of it? These days do we really experience what we are looking at other than through the lens or smartphone screen? Do we ever really go back and look at those photos anyway or is it just a desire to gain the most “likes”? [OK yes I have a blog but my selfies are truly epic lol]. The scene was chaotic, so my only hope was to push my way through the maddening crowd and walk down a few stairs to the restaurant to have an espresso to forget it all. Unfortunately they had no water [?] so were not serving coffee. [For a coffee producing nation, Rio in particular was a coffee bust.] The only available “food” were bags of potato chips and some soda. Further, there was little posted information in Portuguese, and nothing in any other language. The entire experience was truly disappointing, considering it is claimed that this site is one of the “new seven wonders of the world” – in my opinion a label not at all deserved given the many other incredible world archaeological sites we have. I hope Brazil runs the 2016 Olympics more efficiently than this site but if this experience is any example I don’t have a lot of confidence. We shall see.